Mark Jardine, was born and brought up in Dumfries. After going to university in Glasgow he followed a career in the construction industry, before joining his father in modernising the family’s funeral business. A father of three boys, Mark’s love for and pride in this part of the world led him to start The People’s Project, which aims to give local people a real say in their lives. What is the best thing about living in Dumfries & Galloway? The people, the friendliness, the peace and quiet of the hills and the beaches, - but also the close proximity to the Highlands and the Lake District as well as Edinburgh and Glasgow. Who’s the most interesting person you’ve met through your job? There are too many to mention – but everyone has a story to tell and there’s always something fascinating about everyone I’ve met. Do you have a favourite place in Dumfries & Galloway? The hills above Terregles where I walked as a boy, Loch Ettrick and the Queensberry Hills. I have climbed Gana Hill (just over 2,000ft) next to Queensberry about 200 times, - and when I was 19, with skis strapped to my back, - I came face to face with a mountain lion very close to the summit, - but in those days, - no-one had heard of big cats in Galloway! I love to walk the hills, cycle, spend time in the gym and take a sauna, - watch my "hame team" - Queen of the South, - or simply catch up with current affairs. Where do you recommend for a good bite to eat? "The Cavens Arms," where you also get a great pint of real ale. I have absolutely no desire for material possessions. If you could change anything about Dumfries & Galloway, what would it be? Make it a tourist destination like The Lake District, - and by doing so attract more business to the region. What’s your favourite walk in the county? As well as the walks mentioned in my favourite places, there is also a fantastic 10-mile circuit from Dumfries town centre to the high ground above Terregles, returning by the old Glen road, which is all paved. It’s suitable for any age, as long as you can cope with a climb to 500ft or so. Which season do you like best here? It has to be spring, when the days lengthen, the sun is warm, but the air is cool – magic! Tell us about The People’s Project. 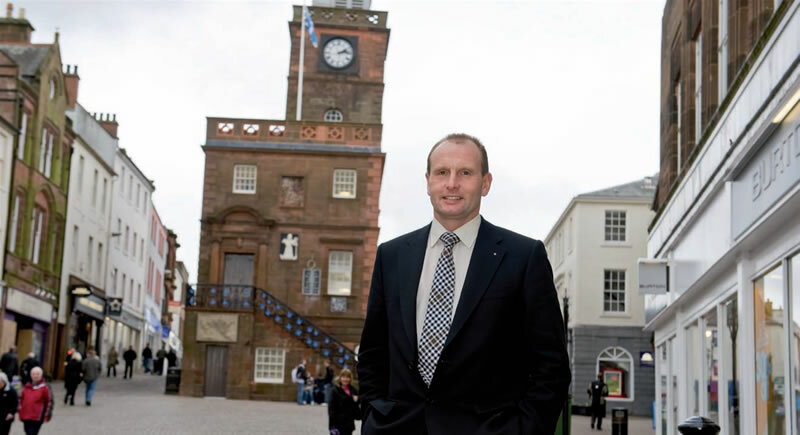 It’s for the people, by the people, working to breathe new life into Dumfries and the region. Essentially, I’d like the public to embrace The People’s Project; for them to realise that this is their opportunity to make a difference to their communities. We’re all happy to raise money for good causes all over the world – and that should obviously continue – but sometimes charity should begin at home, for everyone to benefit from. If Dumfries was in America, it would be part of Disneyland, it has so much to offer: Burns, Barrie, Bruce – and that’s just the Bs! Sum up Dumfries & Galloway for you in one word. Article by kind permission of Dumfries & Galloway Life.